This contrast in thyroid-stimulating activity led the study's authors to hypothesize that chronic fatigue syndrome is caused by low activity of thyroid hormones in the absence of thyroidal disease. 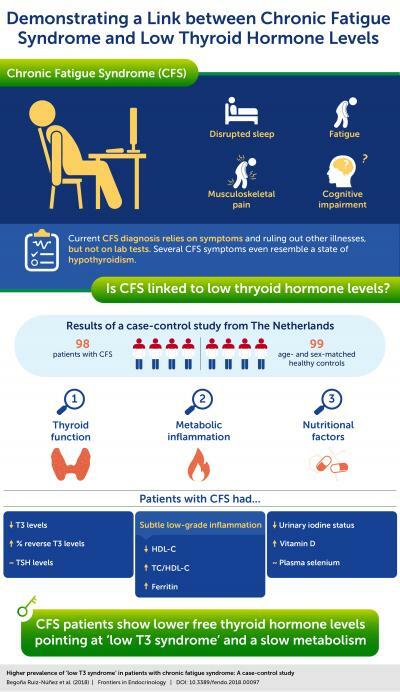 Additional analyses indicated that CFS patients had a lower urinary iodine status and low-grade inflammation, which possibly mirrored the symptoms of patients with hypothyroidism. These CFS patients, however, had relatively higher levels of another thyroid hormone called "reverse T3" or rT3. This appeared to be due to a shift in hormone production, where the body preferred to convert T4 to rT3 instead of producing T3. The low T3 levels found in CFS patients coupled with this switchover to rT3 could mean that T3 levels are severely reduced in tissue. "One of the key elements of our study is that our observations persisted in the face of two sensitivity analyses to check the strength of the association between CFS and thyroid parameters and low-grade inflammation," says Dr. Ruiz-Núñez. "This strengthens our test results considerably."